Paperboys are surely becoming rare in this country as circulations decline and more newspapers prefer to have adults to deliver their product. Filmmaker Mike Mills provides a 40-minute glimpse into this dying breed when he looks at the lives of six paperboys in Stillwater, MN. 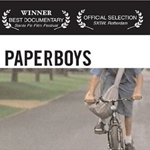 Paperboys shows the boys at work and relaxing at home while they talk about their lives. They deliver their papers on bicycle to nice middle-class homes on tree-lined streets. Their town, as shown in the movie, seems to be a haven, the kind of place that still has something as old-fashioned as paperboys. As different as their personalities are, they have a lot in common. Many of them have a preference for rap and video games. They all have a lot of stuff (thanks to their paper delivery income, no doubt). They also seem to have a good work ethic. Mills does a good job of highlighting their similarities and differences in this portrait of adolescent American males at the turn of the century. The only extra on this DVD from Palm Pictures is a 17-minute film by Mills called Deformer, about Ed Templeton, a Southern California painter. It’s not a straightforward documentary, but a more poetic look at his life, his art and suburbia. In contrast to Stillwater, MN, Huntington Beach, CA is a world of concrete and strip malls. Listening to Templeton talk about his unhappy adolescence and unhappy lives of other young people living in his area, provides an interesting contrast to the paperboys. The picture and sound on the DVD are good. Paperboys, which was shot on film, particularly stands out. With just under an hour of material, this DVD seems sparse. But the subjects of the two movies make this disc worth a look, especially for anyone who has ever delivered a newspaper.